Google Home’s VP of Product Management Diya Jolly announced the features of the Google Home Hub, which is a smart speaker device with a tablet interface. The Google Home Hub has the Google Assistant built-in so you can use your voice for Search, Google Photos, YouTube, Google Calendar, Google Maps, etc. Jolly pointed out that Google Home Hub was designed in a way that fits into your home. The 7-inch screen has softly rounded corners that fit naturally on any surface whether it is a kitchen counter or nightstand. And it comes in four colors to choose from: Chalk, Charcoal, Aqua, and Sand. And Jolly pointed out that the company consciously decided not to include a camera on the Google Home Hub so consumers would feel comfortable placing it in the private spaces of your home such as the bedroom. On top of the Google Home Hub, you will see an Ambient EQ light sensor so that it can automatically adjust to match the lighting in the room so photos on the Google Home Hub blends into the room. For example, it will automatically dim when it is time to go to bed. 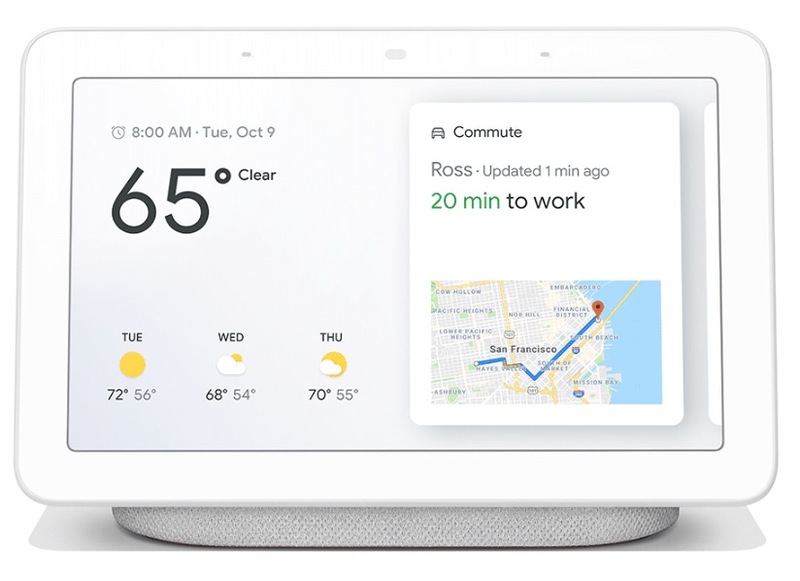 The Google Home Hub supports a feature called Routines, which provides you and your family with useful information about the day such as the weather, traffic information, and calendar events. You can activate Routines by saying “Hey Google, good morning.” Plus the Google Home Hub includes a Voice Match feature, which allows up to six people in the home to set up their own personalized Routines. When you swipe down, you will see your home view. The home view shows you the Internet of Things (IoT) devices that can be controlled in your home with the Google Home Hub. The Google Home Hub is priced at $149 and it is now available for pre-order today via the Google Store. And the Google Home Hub will be available for purchase at Best Buy, Target, Walmart and retailers starting October 22nd.